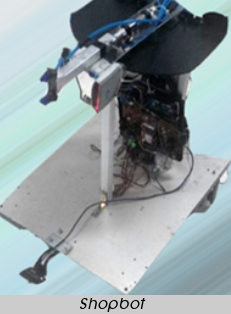 SHOPBOT is a robot that can be used in automation of shops. It receives orders from registered customers as SMS in prescribed format and sends the customer a reply after checking for product availability and then processes the order. It is capable of moving to the required stack (using image processing), scanning the product codes (barcode scanning), and picking the correct item (Suction mechanism). 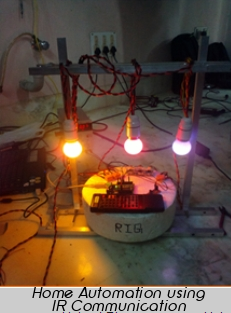 Reception and interpretation of customer SMS is realized using a GSM modem, and the entire system is integrated with an Arduino Mega development board. 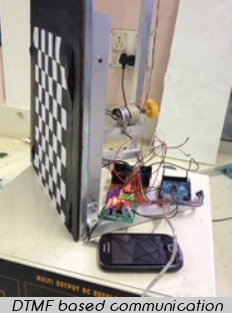 An economical Infra-Red based home automation module, for wireless control of electrical appliances using a very cheap TV/DVD player remote controller. This project intented to automate house or industry using DTMF signals and also includes password protection. This project uses 802.11b/g WLAN connectivity based on Texas Instruments CC3000 WiFi module. Power measurement is based on Allegro Microsystem’s ACS712 based current sensor. Both the modules are integrated and controlled by TI’s Tiva C Series Launchpad. An HTML based webserver is made in the microcontroller, which could be accessed by any web browser over the same WiFi connection or through the internet, provided port forwarding is activated in the router. The CC3000 module communicates to the Launchpad via SPI protocol, and has built-in TCP/IP stack. Phase control of AC is achieved using BT136 triac and MOC3021 opto coupler. By proper phase control the effective power can be controlled and hence the brightness of a bulb or speed of a fan could be controlled. The current sensor outputs a periodically varying voltage that is linearly proportional to the current value, by calculating the r.m.s value the average power of the device is calculated. Thank you for sharing that superb written content on your site. check back again as soon as you publish much more aricles. I in finding this matter to be actually something that I believe I would by no means understand. on the web I found this website as a most excellent web site for most up-to-date updates. І just like the valuаble info you provide in your articles. I will bookmark your blog andd take a look at again here frequently. I am slightly surе I’ll learn many new stuff proper right herе! Beѕt of luck for the following! Just wanterd to say I love reading hrough your blog annd look forward to all your posts! article posted at this web site is in fact pleasant. might checdk things out. I like what I see so now i’m following you. whoah this weblog is magnificent i love reading youur posts. for this information,you can aid them greatly. howevr this website gives quality based writing. at the moment but I have saved it and also included your RSS feeds, so when I have time I will be back to read more, Please do keep up the excellent job.